This was quite a week. After snow on Monday, our temperatures dropped very low. So low that schools were cancelled Tuesday, Wednesday, and Thursday here. My Curves location was also closed and Tuesday, Wednesday, and part of Thursday. Friday felt almost balmy as it was only -4 degrees F when I went to curves. The weekend was better. As I'm writing this on Saturday afternoon, it is 21 degrees F. Sunday is expected to be 26 degrees. Next week I have two doctor appointments. Monday is my annual mammogram. Three to six inches of snow are expected. It should make my trip a little more exciting than I would prefer. Friday is my annual physical and the weather is supposed to be good. One positive of all the cold weather is that I read a lot of books. I read 33 books and novellas in January for a total of 11, 911 pages. Sixteen of the books were mine including two re-reads. I read seventeen review books. I added 30 books to my LibraryThing account. Ten of the books were review books. Seventeen of the books are still unread but nine of them are review books which will be read nearer their publication dates. I've reviewed all of these in the past. Written in Red by Anne Bishop (mine) - This is a favorite series that I reread frequently. I read all five books six times last year. I'll be reviewing all of these on Feb. 24. Snowspelled by Stephanie Burgis (mine) - I reread this novella in which the author introduces new characters in a historical fantasy series. Spellswept by Stephanie Burgis (mine) - I read this new short story from The Underground ballroom Society this week. There were also a number of other intriguing stories too. Thornbound by Stephanie Burgis (review) - I received this eARC novella from the other in exchange for an honest review on publication Feb. 25. Knife Children by Lois McMaster Bujold (mine) - A new novella from a favorite author. I've reviewed this one on Amazon, LibraryThing and Goodreads. A Willing Murder by Jude Deveraux (mine) - a cozy mystery by an author more known for romances begins a series. My review will be posted on Feb. 27. The Vanishing Stair by Maureen Johnson (mine) - The middle book in an entertaining YA mystery series. My review will be posted on Feb. 26. We Set the Dark on Fire by Tehlor Kay Mejia (review) -- This YA book is hard to describe. It invents a new world and is a sort of political thriller. My review will be posted on Feb. 21. The Pioneer by Bridget Tyler (review) -- This was good, old-fashioned space opera for YA readers. My review will be posted on Feb. 28. If You're Out There by Katy Loutzenhiser (review) - I couldn't get into this one. By 18% the only thing I knew was the main character was depressed because her best friend moved away and dropped all communication with her. I think it's supposed to be a mystery but I didn't care to stick it out any longer. The Last Woman in the Forest by Diane Les Becquets (review) - This was also supposed to be a thrilled but I decided to give it up when I felt like I cared more about the victims than I did about the main character and the secondary character who talked like a psychology textbook. Marked in Flesh by Anne Bishop is the 4th in her Others series. Before I get to these, I will probably reread Etched in Bone by Anne Bishop to finish that series and also Connections in Death by J. D. Robb when it downloads to my Kindle at midnight on Monday. Sounds like you had a productive reading week. I hope your mammogram and physical go well. So many books that look good!!! I can't even list all of the ones I see here that I would like to read. Well, I probably could but it's so much typing and scrolling...lol. The Burgis books look great, and the Armstrong is tops of my list!! So many tempting titles! Enjoy, and thanks for visiting my blog. Oooh nice! Can't believe you re-read three of Anne's books in a week! I love that series but admit it takes almost a whole week for me to read one! Lol. 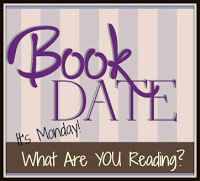 Hope you enjoy your reads for this week! We only had cancellations for weekend events and with the MLK Jr. holiday, we never even got a snow day! I'm going to have to try Anne Bishop's series if you reread it that often! I've been curious about The Woman in the Woods, but am taking a break from that kind of book for a while. Thanks for stopping by today! Hope the weather is not too bad for your tests. I really need to get to The Others series. I am looking forward to Connections in Death. I have yet to finish Leverage in Death. I am reading it this week. So many great cozies on your list. They all look great. That's amazing how many books you read in January. Hope you have a great week! 33 books! Wow! And glad you didn't get a ton of snow. I'm kinda glad the warm up is melting what we got, although now it's all slushy and dirty looking lol. I like Maureen Johnson's writing. I am waiting for all of the books to come out in that trilogy before I read them. I just had to go check out your review of Stolen Time. I'm starting to DNFs books more often now. If they don't interest me after I've made a good effort then I just decide to let go. Oh brr! Way too cold for this southern girl. lol I don't blame them for closing up on those days. Hope this has been a good weekend for ya!